Your wedding day is one of the most important days of your life. The Capuchin Friars (Frati Cappuccini) at St Anthony’s, Hawthorn welcome you to celebrate this day in our beautiful church and we will do what we can to help make this day a very special day for you. 1. If you would like to make an initial enquiry about getting married at St. Anthony’s or to inquire about the availability of dates please contact us. 2. Booking the Church: This should be done well ahead of the planned wedding. You have a better chance of securing your preferred date and time if you make your booking early. The ringing of Church Bell’s after the wedding. Your contribution goes towards the conservation and upkeep of our church, as well as the provision of gardeners, cleaners and secretarial services. The contribution is due one month prior to the wedding. 4. Celebrant: St. Anthony’s has four resident priests and they normally conduct all marriages. If you would like a priest other than one from St. Anthony to officiate at your marriage (a migrant chaplain, a family member or close family friend) please contact the Church for approval. 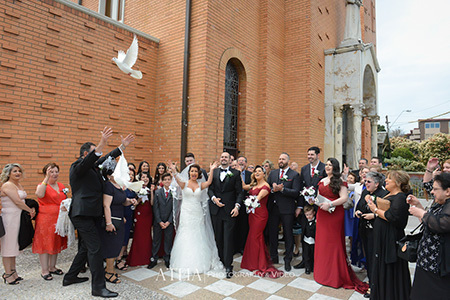 Most weddings at St Anthony’s are conducted in either English or Italian. When may Marriages be Celebrated? Other days can be arranged, with the following exceptions: Holy Thursday, Good Friday, Holy Saturday and those occasions when the Church has been reserved for other religious functions. 1. Notice of intended marriage: This will be filled in with the priest who is preparing the couple for their marriage. In some circumstances it may be necessary to arrange for another Celebrant do this. The form is to be signed by both parties, at least one month prior to the wedding. 2. Birth Certificate or current foreign passport: Both parties require an official certificate showing the date and place of their birth and the registration number. If necessary, a Birth Certificate can be obtained from a Registry of Births, Deaths and Marriages. Persons born in Australia require a birth certificate, persons born outside Australia may use their passport. Baptism certificates: If both parties are baptized they will both require a Baptism Certificate. For a marriage to proceed at Anthony’s, at least one of the parties must be a baptised Catholic and both parties be free to marry i.e. never been validly married before. If one or both of you were involved in a previous religious or civil marriage, please indicate this before you book the Church. Pre-nuptial enquiry form: This will be filled in with the priest who is preparing the couple for their marriage. Application for a dispensation: This will be required when one of the parties is not a Catholic. The priest preparing the couple for their wedding will prepare and handle the necessary application. The priest helping the couple plan their wedding will provide information about these. 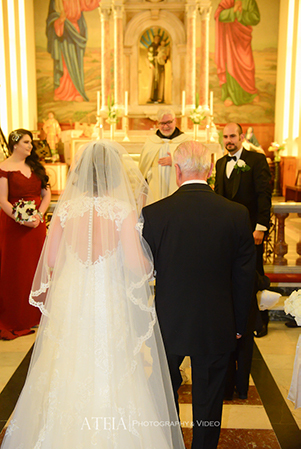 The type of Church ceremony is decided upon by the Bride and Groom in consultation with the Celebrant. The Bride and Groom will be given the opportunity to choose Scripture Readings and Prayers as part of the ceremony. It is important that your marriage service expresses and reflects the Sacramental celebration of a Christian marriage. If you would like to prepare an Order of Service booklet, the priest Celebrant will be able to assist you. St. Anthony does not offer a printing service but is happy to recommend a reliable printer to you. This service is at an extra cost to you. Rehearsal day and time will be arranged with you to take place just prior to the Wedding. Fresh flowers are arranged in the church each Saturday and are suitable for weddings. The colour of the flowers typically reflects the liturgical season, so they do vary. You are free to personally organise with a florist to have prepared arrangements delivered on the day of your wedding but the church does not have facilities to have arrangements prepared on site, the flowers will have to be arranged off site. Pew bows are put on the first three pews (each side of the aisle) for weddings. If you wish to supply your own, contact the Office. The choice of music for your wedding should be in keeping with the sacred nature of the ceremony. It is best to check your choice of music with the Celebrant before you have finalised your selection with your musicians. The church has an excellent sound system. You are free to plug in your own iPod/iPhone to our sound system. Or you can arrange your own musicians to play at your wedding. Payment for organists, singers and other musicians is arranged directly with them at an extra cost to you. The taking of photographs and the use of a video cameras is acceptable but it is requested that photographers and camera operators be discreet and not become a source of distraction. Photographers should speak to the celebrant before the ceremony. Please advise your guests (when sending out invitations) that confetti, rice or anything similar, should not be thrown in or around the Church grounds. We want you to have a clean and tidy Church, but we also want the same for other couples and the Sunday congregations whose support keeps the Church operating. Smoking and the consumption of alcohol in the Church grounds is not permitted. We ask that you advise your wedding party, photographers and car drivers of this matter before the wedding day. The preferred method for contacting us is via text to 0412 686 311 or email.